Tissue expansion has become a major reconstructive modality over the past 30 years. It has become more and more widespread, particularly in the fields of breast reconstruction, burn surgery, and pediatric plastic surgery. In many cases, tissue expansion can be said to have revolutionized plastic surgery. Tissue expansion has numerous advantages. While it provides skin with a near-perfect match in color and texture, minimal donor site morbidity and scarring occur. [3, 4, 5] It also can be used in various parts of the body to provide tissue with specialized sensory function or adnexal characteristics. Examples include the superior sensation of the skin flaps in breast reconstruction and the hair-bearing flaps designed in the treatment of male pattern baldness developed with expanders. [6, 7] In addition, expanded flaps are more resistant to bacterial invasion than random cutaneous flaps. This technique has been extended to other types of tissue, including bladder reconstruction, vascular elongation, and nerve lengthening. Disadvantages include temporary cosmetic deformity during the expansion phase, prolonged period of expansion, the need for multiple procedures, and complications associated with the implant and placement. Tissue expansion induces changes in the vascularity and cellular activity in involved skin. Alterations in microcirculation have been shown to create hardier flaps in expanded versus nonexpanded skin. Histologic evidence supports expansion as a type of delay. Cherry and others showed that in the animal model, expanded skin demonstrated increased vascularity on microangiography. These flaps had significantly increased survival length when compared with acutely raised random-pattern flaps. The capsule that forms around the prosthesis is involved in the increased vascularity and has been shown to have a circulation exceeding that of the subdermal plexus. Removal of this capsule compromises the integrity of the expanded tissue, so it is often unnecessary and sometimes risky. Tissue expansion appears to be useful in almost all regions as an alternative to other reconstructive methods. Primary closure of the soft tissue has been shown to be possible in complicated abdominal wounds using tissue expanders. Difficult decubitus ulcers also have been treated successfully with local flaps following expansion  as an alternative to myocutaneous flaps. The technique has been extended to cover lower extremity defects as well,  although this remains a very problematic region. In the upper extremity, the dorsal skin of the hand is also amenable to expansion when skin grafting is a less desirable option. The use of tissue expanders does have limitations, particularly related to the placement of the expander. An optimal expansion is obtained if the process is done against a hard surface (eg, bone), while an expansion is more complicated if performed against other soft tissues (eg, neck, abdomen). In the latter case, careful monitoring of the progress of the expansion is necessary. The expansion itself may also create some new edges of tissue, sometimes hard solid, which eventually need to be addressed during the final surgery. The technical advances and the improvement of the materials reached in the last few years have now widened the possible use of tissue expanders to an incredible range of clinical situations. Tissue expanders may be custom-made and adjusted to particular and specific use. Some tissue expanders use the osmotic process to fill automatically when inserted in the human body (eg, recreating the orbital socket). Another future project is the creation of a tissue expander with an antibiotic-impregnated capsule or capable of releasing specific growth factors. In recent years, the use of tissue expanders has reached particular notoriety with the public because of the extensive coverage of the expander's use in several cases of separation of conjoined twins. Implants are available in a variety of volumes and shapes (eg, croissant shaped, rectangular, spherical) to provide the maximal surface area and direction of the flap developed for a specific region of the body or shape of the defect. The actual amount of tissue realized is only a fraction (approximately 35%) of the mathematically expected increase in surface area. However, a clear difference was observed in the amount of tissue gained depending on the shape of the expander. In all cases, the importance of preoperative planning with special regard to flap design and consideration of the region of the body undergoing expansion together with its particular characteristics of the skin and adnexal structures to minimize risk and morbidity should be emphasized. An example of a spherical tissue expander is shown in the image below. Intraoperative image of a spherical tissue expander. When available, use existing scars or incisions to minimize scarring and place them perpendicularly to the direction of expansion to reduce tension across the incision once it is closed and expansion begun. This allows for earlier expansion because the risk of dehiscence is reduced. In all cases, meticulous hemostasis must be achieved to prevent hematoma formation, which may contribute to pressure necrosis, possible infection, and the need to remove the expander. Some surgeons prefer to fill the expander with a small amount of fluid at the initial placement, ensuring no tension on the suture line. The expanders then are filled periodically beginning approximately 2-3 weeks following placement and wound healing. Patient discomfort is a good indicator of the maximum volume with which an implant can be filled at one time. Other indicators used to guide the amount of filling include clinical examination of the overlying skin and the use of pressure transducers when patient feedback is unavailable. The latter method has been used in animal studies but not in clinical practice. Rapid expansion performed according to accelerated schedules or continuously with pressure transducer monitoring can result in flaps sized similarly to those of traditional expansion in a shortened span of time. Continue expansion until enough soft tissue to cover approximately twice the area of the defect has been achieved. Waiting 2-3 weeks after the goal volume has been achieved is customary to allow the expanded skin to soften. This may help reduce the amount of contraction encountered at the time of flap transposition. Interestingly, 2-3 times the recommended fill volumes may be instilled safely without adversely affecting the devices. In some cases, always following the recommendations of the manufacturer, the implant is hyperinflated to a few times the designated volume in order to achieve more expansion. In any case, an adequate final outcome always depends on careful planning, meticulous technique, close follow-up, and patient compliance. The images below depict the stages of expansion and closure. Tissue expander at full volume in the subcutaneous plane located in the lumbar region. Expanded flap prior to closure of soft tissue defect. Soft tissue defect closed with expanded flap. Most hematomas result from inadequate hemostasis at the time of placement but may be associated with the erosion of blood vessels with expansion. Seromas most commonly occur with breast reconstruction but may be minimized with partial insufflation of the implant at the time of placement to eliminate dead spaces in the dissected submuscular pocket. Drains commonly are placed intraoperatively and are removed as soon as the drainage becomes minimal. Similar criteria to removal as those used when discontinuing drains of other techniques of flap surgery may be applied. The rate of infection with tissue expansion is relatively low. Despite the enhanced ability of expanded flaps to resist infection compared to other types of flaps, the presence of a foreign body predisposes that area to infection. This also may occur late in the process of expansion during the installation process. Severity ranges from a mild infection that may be treated nonoperatively, allowing completion of the expansion process, to a fulminant case necessitating removal of the prosthesis. Perioperative antibiotics routinely are given. Exposure of the implant with or without flap necrosis is an indication to abort the procedure and remove the implant. This usually results from inadequate dissection of the implant pocket with later suture line breakdown. Healing is allowed to occur and the process is repeated at a later time when indicated. However, some surgeons may opt to continue the expansion process if they determine that the infectious process does not jeopardize the site. This practice is not standard and is based only on anecdotal experience and subjective interpretation. Minor complications include pain with filling of the prosthesis and temporary cosmetic deformity during the expansion phase. Yesilada AK, Akçal A, Dagdelen D, Sucu DÖ, Kilinç L, Tatlidede HS. The feasibility of tissue expansion in reconstruction of congenital and aquired deformities of pediatric patients. Int J Burns Trauma. 2013. 3(3):144-50. [Medline]. [Full Text]. Cherry GW, Austad E, Pasyk K, McClatchey K, Rohrich RJ. Increased survival and vascularity of random-pattern skin flaps elevated in controlled, expanded skin. Plast Reconstr Surg. 1983 Nov. 72(5):680-7. [Medline]. Austad ED, Rose GL. A self-inflating tissue expander. Plast Reconstr Surg. 1982 Nov. 70(5):588-94. [Medline]. Pasyk KA, Austad ED, McClatchey KD, Cherry GW. Electron microscopic evaluation of guinea pig skin and soft tissues "expanded" with a self-inflating silicone implant. Plast Reconstr Surg. 1982 Jul. 70(1):37-45. [Medline]. Hallock GG. 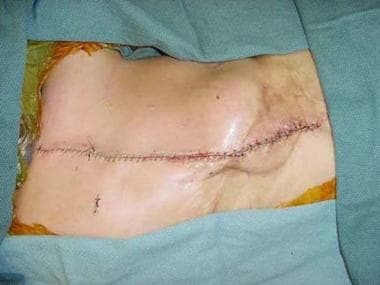 Tissue Expansion Techniques to Minimize Morbidity of the Anterolateral Thigh Perforator Flap Donor Site. J Reconstr Microsurg. 2013 Jun 19. [Medline]. Anderson RD. The expanded "BAT" flap for treatment of male pattern baldness. Ann Plast Surg. 1993 Nov. 31(5):385-91. [Medline]. Adson MH, Anderson RD, Argenta LC. Scalp expansion in the treatment of male pattern baldness. Plast Reconstr Surg. 1987 Jun. 79(6):906-14. [Medline]. Barker DE, Dedrick DK, Burney RE, Mathes SJ, Mackenzie JR. Resistance of rapidly expanded random skin flaps to bacterial invasion. J Trauma. 1987 Sep. 27(9):1061-5. [Medline]. Manders EK, Schenden MJ, Furrey JA, Hetzler PT, Davis TS, Graham WP 3rd. Soft-tissue expansion: concepts and complications. Plast Reconstr Surg. 1984 Oct. 74(4):493-507. [Medline]. Pasyk KA, Argenta LC, Hassett C. Quantitative analysis of the thickness of human skin and subcutaneous tissue following controlled expansion with a silicone implant. Plast Reconstr Surg. 1988 Apr. 81(4):516-23. [Medline]. Zhou Y, Yan Z, Zhang H, Lu W, Liu S, Huang X, et al. Expansion and delivery of adipose-derived mesenchymal stem cells on three microcarriers for soft tissue regeneration. Tissue Eng Part A. 2011 Dec. 17(23-24):2981-97. [Medline]. Sheng L, Yang M, Liang Y, Li Q. Adipose tissue-derived stem cells (ADSCs) transplantation promotes regeneration of expanded skin using a tissue expansion model. Wound Repair Regen. 2013 Sep. 21(5):746-54. [Medline]. Machida BK, Liu-Shindo M, Sasaki GH, Rice DH, Chandrasoma P. Immediate versus chronic tissue expansion. Ann Plast Surg. 1991 Mar. 26(3):227-31; discussion 232. [Medline]. Mackay DR, Saggers GC, Kotwal N, Manders EK. Stretching skin: undermining is more important than intraoperative expansion. Plast Reconstr Surg. 1990 Oct. 86(4):722-30. [Medline]. Austad ED, Thomas SB, Pasyk K. Tissue expansion: dividend or loan?. Plast Reconstr Surg. 1986 Jul. 78(1):63-7. [Medline]. Cordeiro PG, Pusic AL, Disa JJ, McCormick B, VanZee K. Irradiation after immediate tissue expander/implant breast reconstruction: outcomes, complications, aesthetic results, and satisfaction among 156 patients. Plast Reconstr Surg. 2004 Mar. 113(3):877-81. [Medline]. 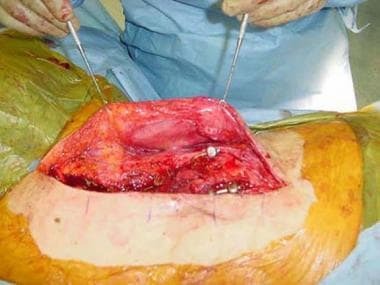 de Runz A, Boccara D, Bekara F, Chaouat M, Mimoun M. Outcome of 122 delayed breast reconstruction following post-mastectomy radiotherapy: The scarless latissimus dorsi flap with tissue expansion technique. Ann Chir Plast Esthet. 2016 Sep 7. [Medline]. Ward J, Cohen IK, Knaysi GA, Brown PW. Immediate breast reconstruction with tissue expansion. Plast Reconstr Surg. 1987 Oct. 80(4):559-66. [Medline]. Argenta LC, Marks MW, Grabb WC. Selective use of serial expansion in breast reconstruction. Ann Plast Surg. 1983 Sep. 11(3):188-95. [Medline]. Manders EK, Graham WP 3rd, Schenden MJ, Davis TS. Skin expansion to eliminate large scalp defects. Ann Plast Surg. 1984 Apr. 12(4):305-12. [Medline]. Iwahira Y, Maruyama Y. Expanded unilateral forehead flap (sail flap) for coverage of opposite forehead defect. Plast Reconstr Surg. 1993 Nov. 92(6):1052-6. [Medline]. Hata Y, Hosokawa K, Yano K, Matsuka K, Ito O. Correction of congenital microtia using the tissue expander. Plast Reconstr Surg. 1989 Nov. 84(5):741-51; discussion 752-3. [Medline]. Sagehashi N. Cleft lip repair by soft-tissue expansion. Ann Plast Surg. 1992 Aug. 29(2):164-8; discussion 168-9. [Medline]. Man D. Stretching and tissue expansion for rhytidectomy: an improved approach. Plast Reconstr Surg. 1989 Oct. 84(4):561-9; discussion 570-1. [Medline]. Vaienti L, Masetto L, Davanzo D, Marchesi A, Ravasio G. Giant congenital nevi of the scalp and forehead treated by skin expansion. Pediatr Med Chir. 2011 Mar-Apr. 33(2):98-101. [Medline]. Esposito G, Di Caprio G, Ziccardi P, Scuderi N. Tissue expansion in the treatment of pressure ulcers. Plast Reconstr Surg. 1991 Mar. 87(3):501-8. [Medline]. Borges Filho PT, Neves RI, Gemperli R, Kaweski S, Kahler SH, Banducci DR, et al. Soft-tissue expansion in lower extremity reconstruction. Clin Plast Surg. 1991 Jul. 18(3):593-9. [Medline]. Neumann CG. The expansion of an area of skin by progressive distension of a subcutaneous balloon. Plast Reconstr Surg. 1957. 19:124. Jackson IT, Sharpe DT, Polley J, Costanzo C, Rosenberg L. Use of external reservoirs in tissue expansion. Plast Reconstr Surg. 1987 Aug. 80(2):266-73. [Medline]. Gibney J. 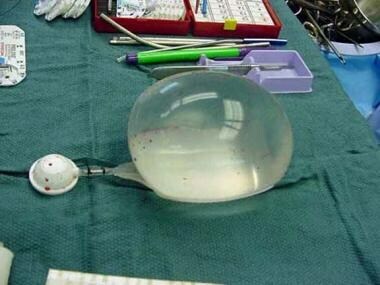 Use of a permanent tissue expander for breast reconstruction. Plast Reconstr Surg. 1989 Oct. 84(4):607-17; discussion 618-20. [Medline]. van Rappard JH, Molenaar J, van Doorn K, Sonneveld GJ, Borghouts JM. Surface-area increase in tissue expansion. Plast Reconstr Surg. 1988 Nov. 82(5):833-9. [Medline]. Radovan C. Tissue expansion in soft-tissue reconstruction. Plast Reconstr Surg. 1984 Oct. 74(4):482-92. [Medline]. Wee SS, Logan SE, Mustoe TA. Continuous versus intraoperative expansion in the pig model. Plast Reconstr Surg. 1992 Nov. 90(5):808-14. [Medline]. McCullough MC, Roubard M, Wolfswinkel E, Fahradyan A, Magee W. Ectropion in Facial Tissue Expansion in the Pediatric Population: Incidence, Risk Factors, and Treatment Options. Ann Plast Surg. 2016 Aug 13. [Medline]. Brown MH, Markus YM, Belchetz B, Vearncombe M, Semple JL. Microbial growth in saline breast implants and saline tissue expanders. Plast Reconstr Surg. 2002 Jun. 109(7):2242-4; discussion 2245-6. [Medline]. Darouiche RO, Netscher DT, Mansouri MD, Meade R. Activity of antimicrobial-impregnated silicone tissue expanders. Ann Plast Surg. 2002 Dec. 49(6):567-71. [Medline]. Gundlach KK, Guthoff RF, Hingst VH, Schittkowski MP, Bier UC. Expansion of the socket and orbit for congenital clinical anophthalmia. Plast Reconstr Surg. 2005 Oct. 116(5):1214-22. [Medline]. Keskin M, Kelly CP, Yavuzer R, Miyawaki T, Jackson IT. External filling ports in tissue expansion: confirming their safety and convenience. Plast Reconstr Surg. 2006 Apr 15. 117(5):1543-51. [Medline]. LoGiudice J, Gosain AK. Pediatric tissue expansion: indications and complications. J Craniofac Surg. 2003 Nov. 14(6):866-72. [Medline]. Radovan C. Breast reconstruction after mastectomy using the temporary expander. Plast Reconstr Surg. 1982 Feb. 69(2):195-208. [Medline]. Ronert MA, Hofheinz H, Manassa E, Asgarouladi H, Olbrisch RR. The beginning of a new era in tissue expansion: self-filling osmotic tissue expander--four-year clinical experience. Plast Reconstr Surg. 2004 Oct. 114(5):1025-31. [Medline]. Sharobaro VI, Moroz VY, Starkov YG, Strekalovsky VP. First experience of endoscopic implantation of tissue expanders in plastic and reconstructive surgery. Surg Endosc. 2004 Mar. 18(3):513-7. [Medline].